TexShare is a cooperative program designed to improve library service to all residents of Texas. Both academic and public libraries are members. A TexShare card enables holders to borrow materials from and use resources at other member libraries. 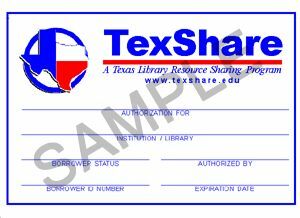 Borrowing privileges at member Texas libraries through the use of the TexShare card. You can get a TexShare card by completing a short application at the circulation desk. 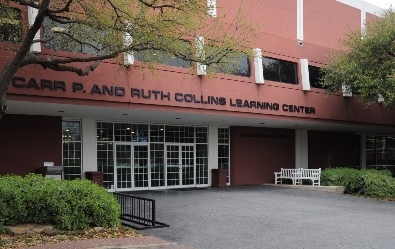 Only current DBU students, faculty, and staff are eligible. TexShare cards for students must be renewed every semester. Cards expire at the end of each semester. Students who apply at the circulation desk will receive their cards immediately. Cards for online applicants will be mailed to the address provided on the form. TexShare cards must be signed on the back to be valid. A list of TexShare library members can be found at the TexShare website. Please note: each library sets its own policies for TexShare members; those policies are also listed on the website. You may wish to contact the library to confirm its policies before your visit. privileges at DBU as well as TexShare privileges statewide. Use your TexShare privileges responsibly!